Apologies for the radio silence – I’ve just come back from a short holiday overseas. The holiday has left me feeling very relaxed and calm – which is a good thing since this blog is about something that tends to turn me very quickly into an angry deaf person. Yes, I’m talking about people criticising my work! Our Must do better! campaign report on educational under achievement has not, it seems, been widely welcomed and we have received a range of negative comments about it. Whilst I love constructive criticism with my morning cup of tea, and ruefully recognise that most things I do will be far from perfect, some of the feedback received has been frustrating. We’ve been told that the data on how deaf children are doing in schools is not perfect. Without being too rude, my initial response is: Duh! The campaign report is quite clear that better data is needed and the page where all the data is shown includes a health warning box that sets out the caveats in more detail. But should this mean that we throw out all the data we have and not use it? I take the view that the data, as imperfect as it is, is still useful. It highlights a problem that we know exists – that deaf children are under achieving. I’ve seen no data that suggests that deaf children are not under achieving. And there are grounds for thinking that the scale of under achievement may be wider than Government figures are suggesting. The data is also a powerful campaigns weapon. 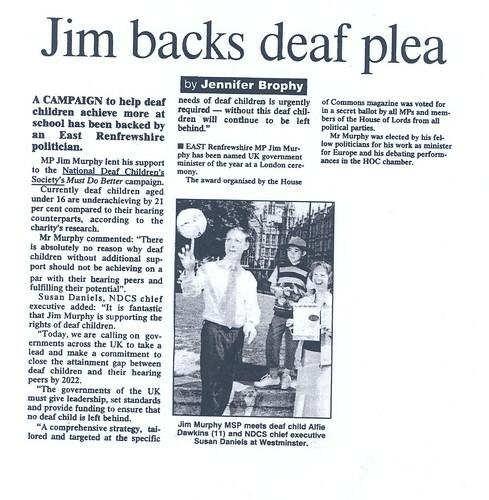 It gives us a basis on which to talk to the media and MPs about the fact that deaf children are under achieving. This is an important point – it will be more difficult to place pressure on the Government to close the gap if we cannot show to others, through evidence (as imperfect as it is), that demonstrates there is a problem that needs action. But more widely, it is not data that we’ve just made up on a rainy Friday afternoon. It is data provided to us by the Government, who have cleared the publication of it for our report. We’re campaigning for the Government to improve it’s data collection but if it’s good enough for their purposes, I see no reason not to use it ourselves. Page 1 of the report, in the opening two paragraphs, we refer to the dedication of professionals and the need to provide more support to professionals. We make it very clear on page 2 that we do not believe that teachers and specialist staff are getting the resources they need from local authorities to able to support deaf children. On page 4, we set out how many parents are satisfied with the provision for their child and the clear dedication from professionals. Throughout the report, there are many more such references, including quotes from parents about the positive support they’ve received. None of this seems to get an acknowledgement. In fact, it’s seemingly wilfully ignored. Apparently, even the title of the report – Must do better – has proved offensive even though it was meant as a fun play on words you might hear in the classroom. 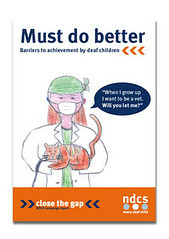 We were actually thinking of central Government when we thought up the title – and it’s interesting that the old Minister for SEN, Lord Adonis, did not seem to have a problem with it when he congratulated NDCS on the report (again, I won’t let it go to my head). This is perhaps the most interesting criticism because it seems to imply a fear of parents or of possibly being asked to hold up their services to account. I don’t think good local services have anything to fear from the report – they can use it to show how they’re meeting the needs of deaf children. If they’re lacking in support and resources, they can use the report themselves to lobby their local authority for more support and resources. Some of the feedback has had a point and has been useful and will be taken into account. For example, we were, in retrospect, wrong to name specific local authorities in our case studies and we were doubly wrong to (inadvertently) use two negative case studies from the same area. But generally, it has been frustrating that there seems to have been a complete misunderstanding of the need for a campaigns document to be loud and brash and urgent in setting out the problems and calling for actions. It is doubly frustrating given the effort that was made to recognise the important role of professionals and to recognise some of the positive comments from parents around the country. Some of the feedback I’ve had from other campaigners has been the report is actually far too nice for a campaigns document and should have been harder in tone. After all, a document which is warm and cuddly which says there may be a problem, but we can’t give you any numbers and anyway, it may be misused or upset people will not rally decision-makers to action. And action is needed. It is one of our soundbites but deafness itself is not a learning disability. There is no reason for most deaf children to be under achieving any less than their hearing peers and I believe it is a scandal that any one deaf child is under achieving because of their deafness. I would happily go home and begin a career in knitting the day I see comprehensive evidence that deaf children are not under achieving. But whilst I see examples of good practice and of deaf children proving the art of the possible, there are still too many deaf children being let down. This is the objective of the campaign report – to make sure that more support and resources are available to parents, professionals and children to make sure that every deaf child achieves their full potential. And this is what is the most frustrating of all – that some people would seemingly rather quibble over our campaign report, rather than take action to support this objective. I’ve been looking at some of our internal statistics… and more people seem to be reading my blog than writing to their MP to tell him/her about our campaign! So for this post, I’d like to encourage you to write to your MP about our Must do better! campaign report. Get him/her to ask the Department for Children, Schools and Families to implement the recommendations of our report. Click here to write to your MP. Or here. Here will do as well. Still unpersuaded? Here are five good reasons to write to your MP. 1) We have special software on our website that makes it quick and easy for you to do this. If it takes you longer than 5 minutes, I’ll give you a Malteser to compensate you for your time. 2) You don’t need to know who your MP. Just type in your details and we’ll work it out. We promise not to tell anyone that you don’t know. 3) We write a draft letter for you so you don’t have to do any work. You can just email it straightaway at the click of the button or you can print it off, sign it and pop it in the post. And if you want to personalise the letter so you sound less like me, you can do that too. 4) You’ll help us make a difference. MPs do take notice of these things. They’re scared of you because you can drive them out of a job. So you can use that power to get MPs to take notice of the fact that deaf children are being let down. The more MPs that take notice, the more the Government takes notices, and the more the Government notices, the more the people who have the power to change things start to change things for the better. So it it all starts with you. 5) And finally, you’ll make me happy. You can also make me happy by buying me some chocolate digestives but I’ll settle for writing to your MP. And if you’ve already done it, why not email your friends and family to tell them all about it? We have special software that allows you to do that too! We support the aspirations of those, like the National Deaf Children’s Society, who believe that the perfomance gap between children with a physical or sensory impairment and children without special educational needs should be eliminated. Our priroirty is to personalise learning, by focussing on each pupil’s progression, so that every child achieves their potential, whatever their starting point. High quality, systematic phonics… should be the prime approach for teaching children to read. Arghh! Phonics is a way of teaching literacy to children which basically involves listening to the sounds of words. Because it involves listening, our report specifically says that the emphasis on phonics can sometimes be inappropriate for teaching many children literacy. So why is phonics being advocated as the prime approach? Slightly frustrating. Our renewed literacy strategy builds on Sir Jim Rose’s independent review of the teaching of early reading by putting phonics at the heart of teaching reading in order to help to raise attainment levels amongst all pupils. 3) We also managed to get lots of local papers from across the UK, from Glasgow to Cambridge covering our campaign, and highlighting how their local MP was supporting it. Here’s an example from Glasgow about Jim Murphy‘s support for our campaign. Local press coverage like this is helping us spread awareness of the problem across the UK. Disability Now magazine also covered the story. 4) Finally, Lord Adonis has agreed to meet with NDCS in September. This is very good news, and will hopefully allow us to explain in person why the need for action is so urgent. And why I go “Arrrgh!” everytime I hear the word ‘phonics’. We’re currently thinking up our ‘hit list’ of things we want to ask him to do. My overall assessment? Well, we haven’t changed the world, but then that was never really going to happen overnight. Some of the replies coming through so far are slightly disappointing in their emphasis on phonics, suggesting that key civil servants haven’t really digested this point. But I hope we’ve created a wide and warm base of support from which seeds of action may grow. It is encouraging that MPs are raising issues relevant to us – sometimes at our prompting but often at their own behest. Clearly we have some way to go – but we’ve made some small steps forward. What’s your assessment? Let me know your thought while I take some big steps forward towards the pub. Well, I am still alive after a week in which our campaign report was published. Sleep-deprived, but alive! It’s been a great week – it may even constitute one of the highlights of my professional career – though the time when I was a civil servant and fell asleep in the back of a Ministerial car while the Minister was still talking to me takes some beating. Yes, our campaign report was launched on Tuesday at College Green, just outside the Houses of Parliament. Around 45 MPs came along to help launch it and have their photo taken with some deaf children from Barking, East London and our Chief Executive, Susan Daniels. The turnout was one of the highest we’ve ever had for a NDCS event. 1) Lord Adonis is in the first photo, the one with the purple tie. He’s the Government Minister responsible for children with special educational needs. 2) Then we have Michael Gove. He’s the shadow Minister responsible for Children, Schools and Families in the Conservative party. 3) Oscar winning actress, now MP, Glenda Jackson graced us with her presence. 4) And a personal hero of mine, David Blunkett, also came down to say hello. So many MPs came that some were forced to wait for a few minutes to get their photo taken… Which made for a prime opportunity to lobby them… *evil cackle* But everyone I spoke to seemed really supportive of what we were trying to achieve and keen to do what they can to help. Lord Adonis even said the report was “excellent”. I won’t let it go to my head. Well, maybe a little bit. Then it was all over, as soon as it had started and the children returned to school. As painful as it was to admit it, after all the work over the past few weeks, this is only just the beginning. Now we need to campaign to get the Government to implement all the recommendations that we called for. Lots more work to do! You can read the report here. And if you want to take action to support it, you can write to your MP asking him or her if he/she agrees that it’s outrageous that deaf children in England are 42% less likely to get 5 GCSEs at grades A to C.
But, for now, I’m off on holiday! I’m taking 2 and a half weeks off to recharge my batteries. I look forward to telling you all about what’s in my inbox when I get back. … but here’s an exclusive preview of the cover of the campaign report we’ll be launching next week. The drawing was the winning entry to our “When I grow up…” postcard drawing competition. Everyone in the office loved it so where better to put it than the cover of our report. We took our time to come up with a title – and went for “Must Do Better” in the end. It’s a playful challenge to the Government using the language of school classrooms (of mine, anyway). The hope is that it gets people’s attention and helps them understand quickly what the report is about.